Having a few vintage Eterna watches I decided this time to have a look at the current range and this one, the Madison is my favorite and one that might well make it on to my short list for this year. Not Automatic as you might think, but actually a hand wound model, it certainly isn’t the usual “wind it every day” type at all. The Eterna Madison 8 day hand wound Gents. 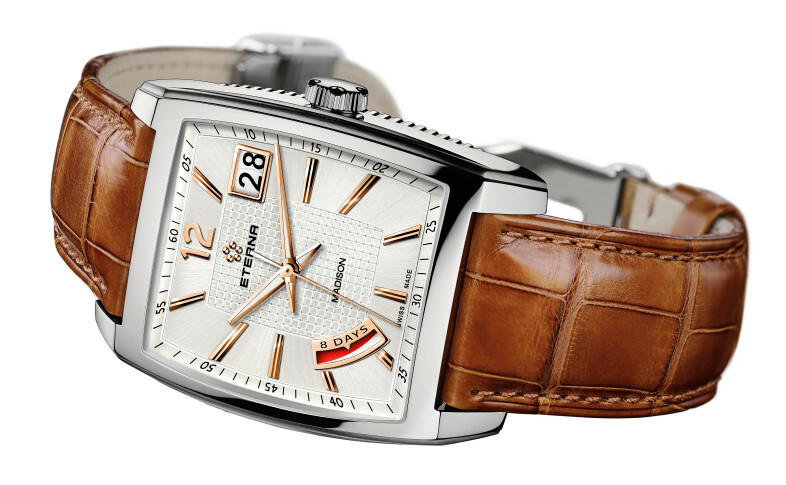 This is an 8 day Eterna Calibre 3510, hand-wound mechanical movement with Eterna Spherodrive, 28,800 A/h, 22 jewels. Analog functions are hour, minute and seconds display with Big Date. The Power reserve is theoretically a 10-day power reserve, though is limited to 8 days (192 hours) by a balance stop mechanism to ensure optimum accuracy. So practically you would only wind it maybe 3 times in a month. The case is Case is polished stainless steel and tonneau shaped like my old vintage Eterna-Matic 2002 and the dimensions are 38.5 mm x 53.5 mm, height 9.3 mm (the lug to lug is about as big as I can manage wrist wise) and the back is screwed down by four screws. Water resistance is 30 m (3 bars). The dial is silvered and depending on model either gray or black brushed sun-ray, with cobbled pattern structure, faceted baton indexes and Arabic numeral appliqué at 12 o’clock. The large date display is at 2 o’clock and the Power Reserve Indicator is between 7 and 8 o’clock. The hour and minute hands are rhodium-plated or gold-coloured, coated with a white luminescent substance, and the central seconds also hand rhodium-plated or gold-coloured. Over the dial the crystal is in scratch-resistant anti-reflective sapphire and the strap/bracelet options of black, brown or gray Louisiana alligator leather strap with deployment buckle. 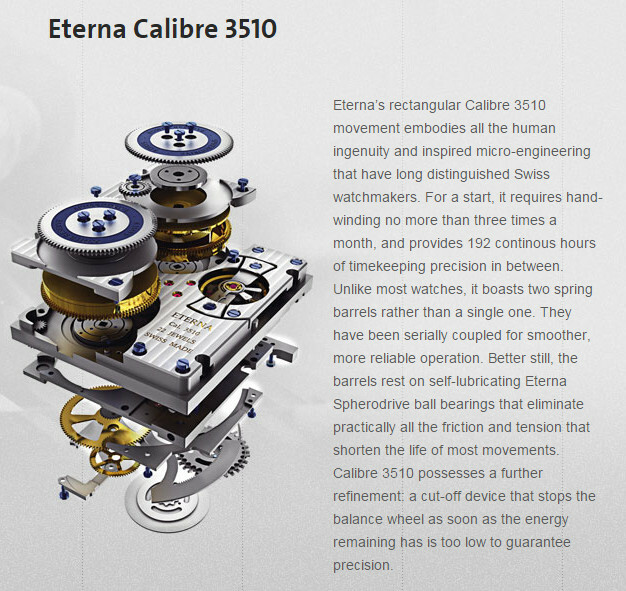 Eterna Calibre 3510 – Spherodrive with twin barrels 8 day capability. It is of course the movement which is really interesting and innovative – the Eterna Spherodrive Calibre 3510 with serially coupled pair of spring barrels, which work in tandem to produce 192 hours of smooth power. That power is handled very efficiently by the unique cut off mechanism, which deactivates the balance wheel after eight days, when the movement’s power is too low to achieve optimum precision timekeeping. Obviously more a dress watch than anything, which is fine for me these days as I seem to be increasing my dress collection for whatever reason. Also I don’t have that many rectangular models and that’s mostly owing to that lug to lug measurement. Too big and there’s that overhang on the wrist and the watch just doesn’t sit well. The Madison is fortunately just within my limits and with it’s standard strap/spring bar fixing it should wrap immediately around the wrist, so should be fine. The Madison is however quite expensive at around £5400 and above my usual area of interest, but it’s unusual and from an excellent Maker. Whether it’s worth it for me is perhaps debatable, but for such technology and especially mechanical innovation there is, correctly in my opinion, a price premium that’s fully justified. A couple of my other Eterna (vintage) models are 43 and 60 years old and still going perfectly, no batteries to buy, no electronic module decline etc. So perhaps a cost per day basis would be a fairer valuation and in that respect things might take on another aspect entirely! No question about it though – I do like the Eterna brand.